Grow your stock investments in today’s changing environment Updated with new and revised material to reflect the current market, this new edition of “Stock Investing For Dummies” gives you proven strategies for selecting and managing profitable investments. no matter what the conditions. You’ll find out how to navigate the new economic landscape and choose the right stock for different situations–with real-world examples that show you how to maximize your portfolio. The economic and global events affecting stock investors have been dramatic and present new challenges and opportunities for investors and money managers at every level. With the help of this guide, you’ll quickly and easily navigate an ever-changing stock market with plain-English tips and information on ETFs, new rules, exchanges, and investment vehicles, as well as the latest information on the European debt crisis. Incorporate stocks into your investment portfolio Understand and capitalize on current market conditions Balance risk and reward Explore new investment opportunities “Stock Investing For Dummies” is essential reading for anyone looking for trusted, comprehensive guidance to ensure their investments grow. The changes, events and conditions affecting stock investors since that time have been dramatic. Today’s economic and financial landscape offers new challenges and opportunities for investors and money managers. 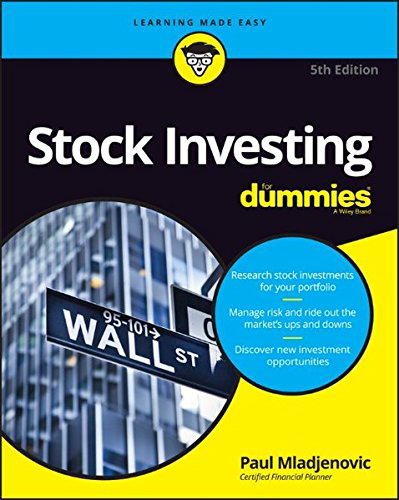 Stock Investing For Dummies, 5th Edition will contain 20% new and revised material designed to keep this title competitive as the stock market prepares to go through a series of changes and responds to global upheavals. Since the last edition, there is plenty of solid, new information on the news, views and resources that stock investors will need to navigate. This entry was posted in Finance Books by Financial Articles Node. Bookmark the permalink.